I've been working my little fingers to the bone. I've pulled extra hours at work. I've had classes full to capacity for the last few weeks. I've had school work (which I should be doing right now instead of typing this post). 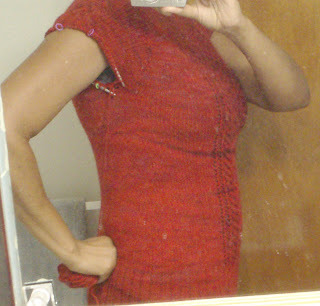 I've had repair projects, and I've had my Julissa test-knit. I just love this pattern. The only change I've made was to lower the placement of the decrease section. Otherwise I've knit this pattern as written, and it was long enough for my very tall body. 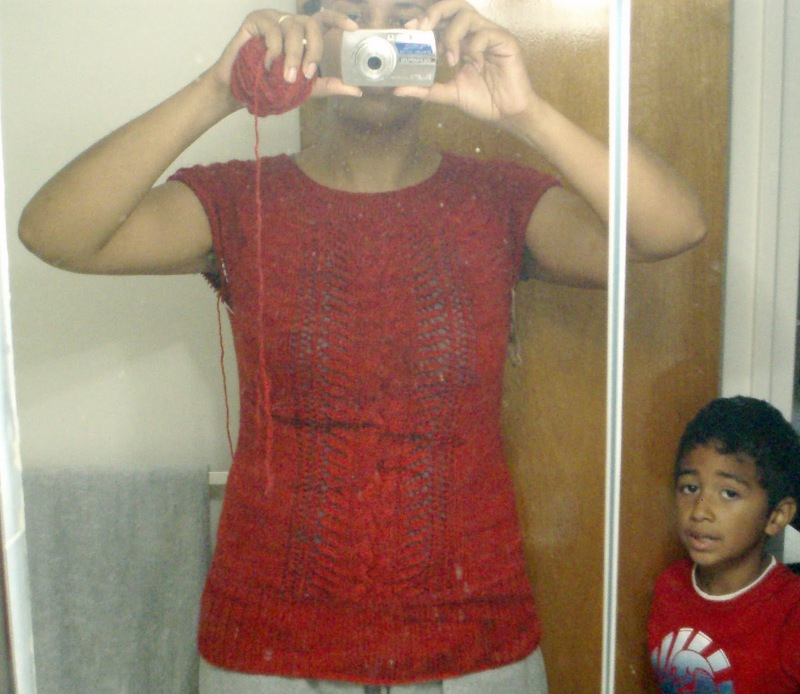 To prove that I've been knitting, and to give you something to look at, I had to take these awful bathroom-mirror shots of me in the sweater :) Alex tried to help, but I had to delete those photos because they look like a 5-year old took them, lol...cause one did. Now, there has been lots of knitting and writing and schematic making and over-night mailing going on around here, and unfortunately I can't show you any of it. But I can say that I did it again, even though I swore I would never do it again. What is 'it', you ask? 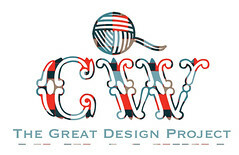 I submitted another design to Interweave Knits for their 2012 Holiday issue. I saw the call for submission and figured I'd just take a look to see what they were looking for. Then I thought, "I have a cute stranded mitten design that I've been kicking around for like...a year. I'll work up a swatch and send it out". Fast forward several weeks, and I realized on Wednesday that the deadline was fast approaching (Monday) and that I still hadn't knit my swatch. Then I worked all Wed, and Thurs, and part of Friday. 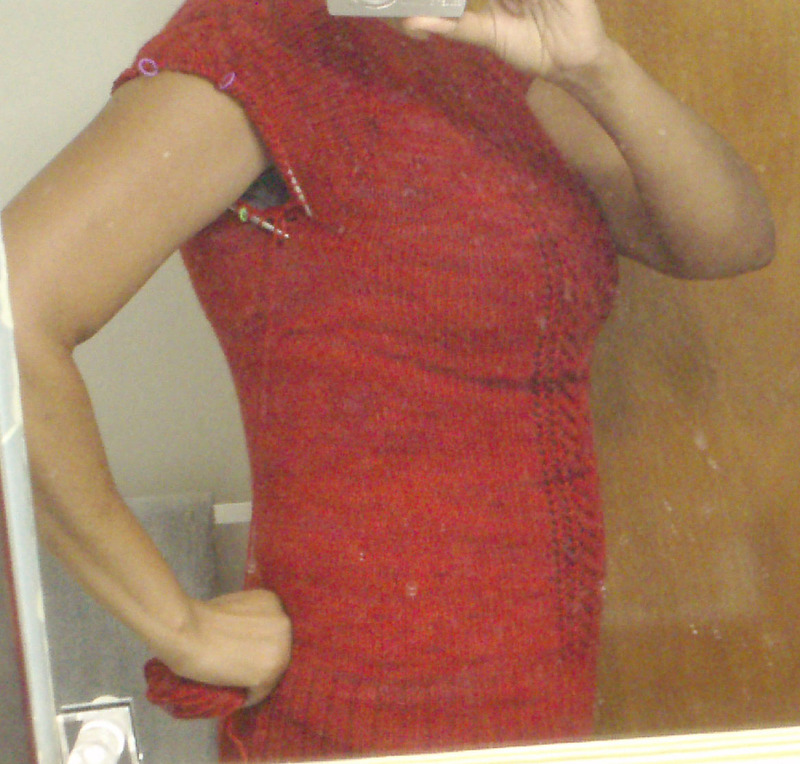 I came home and started swatching on Thursday night and after working on it for a while, I went back to my computer file and realized that the design wasn't what I'd originally planned and I wasn't sure if I liked it as much. Then I scrolled through some of my older stuff and found three super cute designs for children that I loved and I'd been waiting for the right opportunity to use them. I took another look at the submission call and realized that this fit another category better than my original idea did, and that I had a stronger submission with this new idea so I changed my mind and started something totally different about 12 hours before I had to hit the post office. 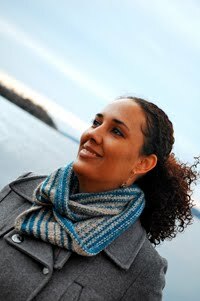 I couldn't decide on which of my three ideas to send them, so I just knit as fast as I possibly could and sent them all. I'm not the best artist when it comes to sketches, so I decided to skip that step and simply knit my swatch in the shape of the intended garment. They were mini-versions of what they would eventually be, and I put all the details on (including buttons and embroidery) so they should really impress then they get there. I also think I wrote a stronger submission proposal and everything was much neater and labeled clearly. I definitely learned from my first go at this. One thing I didn't learn last time (but I did this time) is to pay closer attention to those submission dates so I can avoid dropping 18 bucks to overnight something (especially when I don't know if I'll even get in). So now my little babies are zipping their way through the mail to the good folks at Interweave Press and I'm going to forget all about them because I know from prior experience that I won't hear a thing about them for months and months :) Thankfully, I have lots of other ideas to work on and I'll be too busy to think much about them. And who knows...with three ideas, they're bound to like at least one of them, right? good for you!! I admire your courage and tenacity..oh and of course your talent! !